Linea 1 Station in use since March 27, 2002 (see press release - in Italian - from La Repubblica). Underground level station. 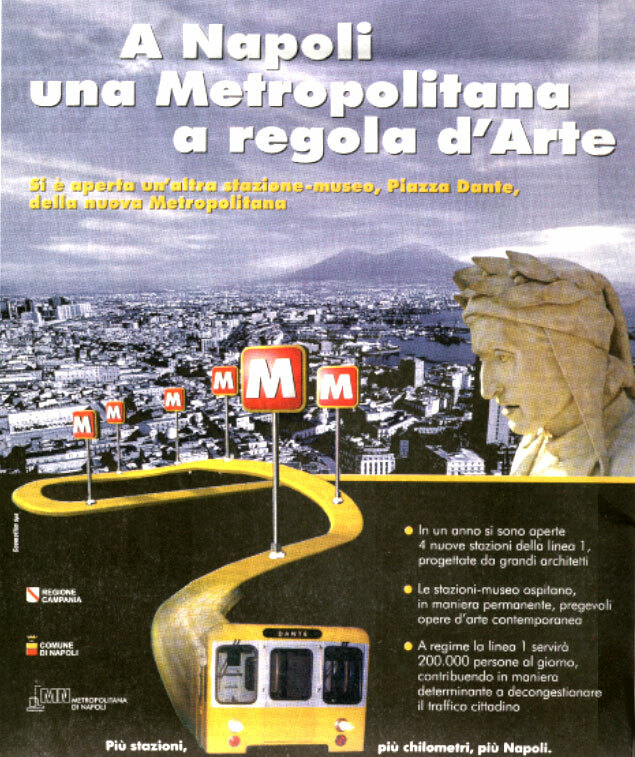 In December 2002 funding has been agreed to create a second exit at Piazza del Gesu' and an underground connection (with tapis roulant) to the station (see news - in Italian - from Il Mattino). For a short description of the station read this press release (in Italian - from Il Mattino) or this press release (in Italian - from La Repubblica). Achille Bonito Oliva talks about art pieces exhibited in the station (in Italian - from La Repubblica of the Arts). All pictures are copyright of La Repubblica of the Arts and have been taken by Peppe Avallone. The poster for Dante station opening. New lightning arrangement has been carried out for the Square (see press release - in Italian - from Il Mattino). March 21, 2002: at end of works for station Dante (Linea1) the statue representing Dante Alighieri is set again at the centre of the Square (see press release - in Italian - from Il Mattino). Read a description of art pieces in exhibition in the station (in Italian - from Il Mattino). Interview with Gae Aulenti, designer of this station (in Italian - from Il Mattino). Another interview with Gae Aulenti (in Italian - from La Repubblica). Gae Aulenti and the Responsible for Archeology Enrico Guglielmo talk about the statue representing Dante and about the arrangement of the Square (see press release - in Italian - from Il Mattino). Experts' opinions on architectural arrangement of the Square (in Italian - from Il Mattino). Benedetto Gravagnuolo's opinion on the arrangement of the Square (in Italian - from Il Mattino). Comment by Carlo Azeglio Ciampi, President of Italian Republic (in Italian - from La Repubblica). Comment by Rosa Russo Iervolino, Mayor of Comune di Napoli (in Italian - from La Repubblica). Comment by Pietro Lunardi, Minister for Infrastructures and Transports (in Italian - from La Repubblica). March 29, 2002: two thousand five hundred signatures collected to ask for more trees in the Square (see press release - in Italian - from Il Mattino). November 15, 2002: more trees and benches will be set in place at Piazza Dante (see press release - in Italian - from Il Mattino). The history of the Square (in Italian - from Il Mattino).